“I need you to make cocktails on Thursday. Sparkling cocktails,” Suzen told me last week. “Oh, time for punch.” I gave my natural reaction. I was not making cocktails for 32 people. “No, individual cocktails. I suggest you do research.” Apparently I was. And so I have. For that many people, I needed something different and exciting. And easy. I didn’t want to be squeezing lemons or limes or oranges for 30+ people. I didn’t want to have three or four alcoholic components. I needed volume, production, swiftness. This is why God has given us sorbet. You get flavor, coldness, and — when slightly softened — scoopability. That’s a technical term that has nothing to do with cat litter. For that many people, I scaled up, putting softened sorbet in our Vitamix and processing to get a base for this cocktail. I had seen a recipe for this beverage that called for orange flavored vodka. For this lunchtime event, we wanted a less forceful drink, so I substituted a simple sugar syrup. I added just enough additional champagne to get a “flowing” mixture. You can then simply pour this mixture into each champagne flute, and top off with champagne. Gently stir to mix. 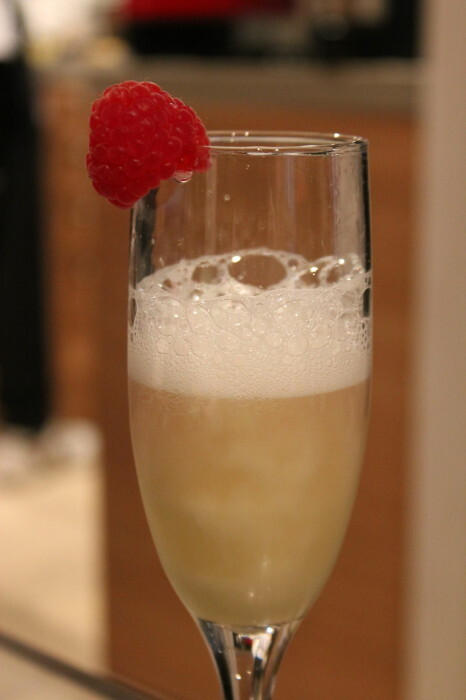 Top with the raspberries and savor the bubbles. Lemon sorbet works perfectly. You can go down another flavor profile: mango, peach, raspberry, … You can even offer up two or three pitchers, each with its own flavor and color. Be prepared: people drink this readily and happily. Combine the sorbet with the simple syrup and 1 cup of champagne in a strong blender. Our Vitamix was a godsend here. Process until you have a smooth mixture that is thick but pourable. You may need to adjust the amount of champagne depending on how much you have softened the sorbet. So, I would add the champagne gradually. Put 2+ tablespoons of this mixture in the bottom of a champagne flute. Fill the flute to the halfway point – or more. Garnish with a raspberry.